More Windhams! Oh there are a lot of them, but this time it's time for the cousins to find love. Megan, well the different thing about her is that she wears glasses, and that does set her apart. But she has a suitor *coughs asshat*. But she is pushing him away, and we learn why *coughs he is an asshat*. Hamish was a soldier, and one with a pretty rough reputation. Then he inherited a title, and he is still rough around the edges, and a Scot to boot. They meet, they like each other. They talk they flirt, but wait, she is almost engaged to that other guy *asshat*. There lies the dilemma, oh and that Hamish is a fool who is all, but I am bad for you, I got a rep. Silly man *smacks him over the head* She loves ya. Cute. And it was fun to meet the family again. I have several of her books but still haven't tried her yet. 2017 - I will read all my TBR pile! I'll try anyway. I like the sound of Hamish! A rough around the edges Scot with a title...sounds like a winner to me. Sounds like a cute read. I'm going to go out on a limb here and guess that her fiancee is an asshat. ;) LOL Have a good week! Ha, yes, this one was fun. I look forward to their brother and sister's story. OH... this sounds really good. 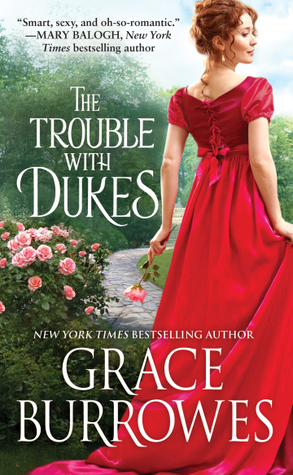 Those troublesome Dukes! Sounds like an easy and fun read. I must get back to reading a few more of her books.